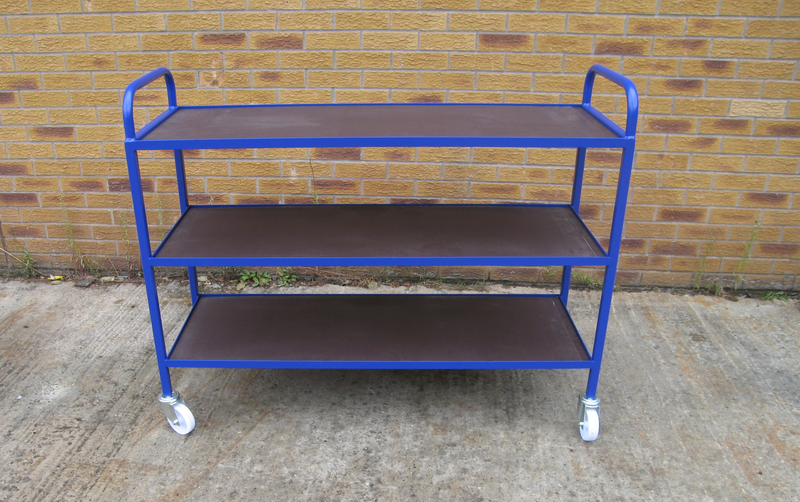 The Physics and Chemistry Tray Trolley has been designed for a nearby school to carry existing trays (12 off) and other lab equipment around the site. The main framework of the tray trolley has been manufactured from formed 25mm x 25mm box section and angle and fitted with 12 mm thick phenolic plywood for the shelves. The units have been powder coated in BS 4800 20 D 45 ripple effect blue to give a hard wearing and durable finish. To manoeuver the trolleys easily they have been fitted with 4 off swivel castors with 100mm diameter blue elastic non-marking tyres. Approximate overall size – 1300mm (L) x 460mm (D) x 1050mm (H).